Read the staff's takes on a host-less Oscars, "Green Book" taking Best Picture and more. Country singer Kacey Musgraves took home Album of the Year. James Michael Troxal suffered a single fatal gunshot wound. Approximately 38,000 Indiana customers were without power as of 3 p.m.
IDS editors share their favorite part of Northwest Indiana. The IDS basketball writers give their season predictions. IDS reporters are talking to voters at the polls, attending watch parties and tallying live results after 6 p.m.
Monroe County polls to be open until 7 p.m.
Higher than expected turnout made lines longer for voters. IDS reporters are gathering results from Monroe County and counties in the 9th Congressional District. 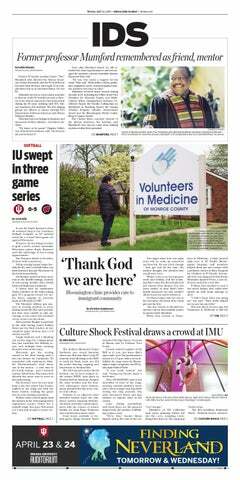 IU mourned two shootings Monday. How many others happened across the country? Shootings across the country injured or killed people as young as 2 and as old as 97. The debate will start at 7. The Hawkeyes controlled the entire game as the Hoosiers never led after the first quarter. The Hoosiers led twice against the Buckeyes, but fell behind for good in the second half. Hoosier Hysteria features a 3-point shooting contest and a men's team scrimmage. There are places at IU and on campus to get help. IU, now 3-1, plays Rutgers, 1-3, this Saturday afternoon. IU never led against the Spartans on Saturday night at Memorial Stadium. IU easily defeated the Cardinals at Memorial Stadium. IU (2-0) defeated Virginia (1-1) at Memorial Stadium.